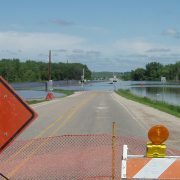 In late 2018, the South Dakota Department of Environmental and Natural Resources (DENR) launched an online flood information system modeled on the system developed by the Iowa Flood Center. The Iowa Flood Information System (IFIS) is the one-stop web platform for tracking flood conditions, forecasts, community maps, and more in Iowa. The newly unveiled Big Sioux River Flood Information System (BSRFIS) is the first large-scale implementation of an IFIS-like system in another state. The project began in 2016, when DENR officials expressed interest in creating a flood information system for the Big Sioux River Basin to enhance flood response and preparedness. Officials wanted flood forecasting models, inundation maps, and community maps for their system, and cited IFIS as an existing system that matched their vision. IFC Director Witold Krajewski jumped at the opportunity to get involved in a project that would map the Big Sioux River, which feeds into rivers in northwest Iowa. The IFC and DENR collaborated with RESPEC, a private engineering company, to develop BSRFIS. The IFC completed cyber components of the project because BSRFIS uses most of the infrastructure and code from IFIS. RESPEC and other sub-contractors handled modeling and mapping. In late 2018, the DENR launched the completed system, which includes five community maps, rainfall forecasts, weather conditions, and other features. IFC will continue to provide maintenance support for the BSRFIS. Following the success of the project, the IFC is looking to pursue similar joint projects in the future. Krajewski also notes that projects in neighboring states including Nebraska, Missouri, Kansas, and Illinois will be a topic of discussion moving forward. For the time being, Krajewski says it is an encouraging development that an outside agency recognized the strength of IFIS.